DJ Project means 2 top DJs and a leading female voice. In October 2000, DJ Gino Manzotti and DJ Maxx decided to establish a new music project. In the following year, they released the first album – “Experience”. In 2002, a new discography appeared – “Spune-mi tot ce vrei”. The same as in the debut album, DJ Project voice was provided by Claudia Pavel, former member of the band Candy. Autumn 2003 – DJ Gino Manzotti and DJ Maxx included Elena Baltagan (Ellie White) in their project and released their first album in this new formula “Lumea ta”. In 2004, DJ Project was the Romanian group who occupied for 40 weeks the Romanian charts with their hit-single “Lumea ta”, being the first group achieving this. In 2005, the single “Lumea ta” started a ‘European career’ being promoted by Ministry of Sound, the largest record company in Europe, specialized in euro-dance music. The radio stations in many European countries air-played the song, both in English and Romanian, and had numerous remixes. Also in 2005, DJ Project releases a new album – “Soapte”. This album received a triple release: first at a club in Timisoara, the second at MTV Live at a concert in Constitution Square in Bucharest and the third, in a club in Bucharest. The first single from the album was “Privirea ta,” a super-hit that topped the charts and was one of the hits of the year, alongside the second single from the album, the song “Soapte”. July 2006 – DJ Project released their fifth album, entitled “Povestea mea”. It contains 15 tracks, including the English version of “Privirea ta” (“Before I Sleep”). The other 14 tracks were first auditions, from which 3 are extended versions. August 2006 – the band received the award “Best Dance Group” at Romanian Top 100 Awards, held in Bacau. September 2006 – the first single from the album, “Inca o noapte”, ranks first position in the Romanian Top 100 chart. November 2006 – DJ Project receives BEST ROMANIAN ACT at MTV Europe Music Awards. Also in November 2006, they released a new single, “Esti tot ce am”. May 2007 – the band gets, for the second consecutive year, the award “Best Dance Group” from MTV Romania. End of 2009 – DJ Project and Elena are breaking up and Giulia is the new voice of the group. DJ Project and Giulia released 3 hit-singles: “Nu”, “Regrete” and “Mi-e dor de noi”, being on first positions in the charts. Giulia withdrew from the band due to pregnancy. 2012 brings a new singer – Adela. The first single released in this formula is “Bun ramas”. 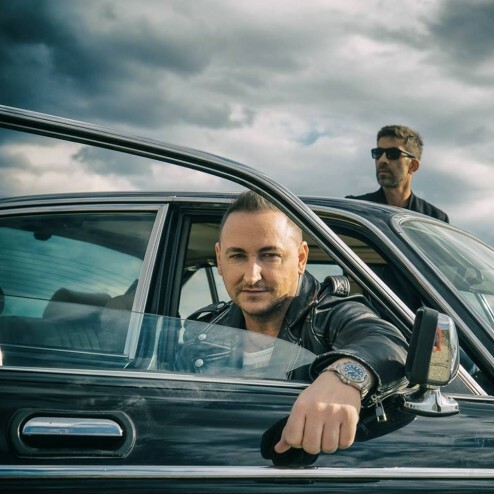 In 2013, DJ Project and Adela released two singles: “Vraja ta” and “Fara tine”. Their fourth single is “Suflet vandut” and it was released in 2014. The song was composed by David Deejay and Alex Pelin. The boys from DJ Project began working with Adela in December 2012, and with each video released, they surprised the public with new elements and thus continue to maintain a successful musical story.